A fifty-nine year old female presented to Ashley & Martin with twenty years of hair loss. The loss was clearly Androgenetic Alopecia with excessive thinning between the crown and hair line area. No treatment other than shampoos and hair vitamins had been used prior to the consultation. The patient’s loss was so pronounced that failure to act at that point would have rendered any form of treatment futile. Given the condition, a full medical program was recommended, along with blood tests to rectify the issue and start the regrowth process. The patient was nervous about taking the first steps and using medication so all other options were discussed. The patient felt comfortable addressing the issue with the use of a laser cap. We advised that medication would also be suitable to add to this at some point in the future. The patient came to the clinic about four months after commencing the treatment and showed early signs of an improvement with growth most noticeable towards the frontal hairline. The patient had displayed solid compliance with the laser cap usage and was buoyed by the signs of progress. 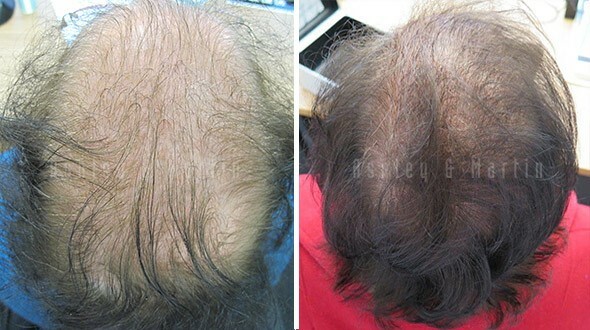 After approximately eight months of treatment, the patient came in to the clinic for a second check-up and the progress was clearly evident right through the scalp. She was extremely happy with the results at that point and thanked us for providing her the motivation to act on the problem. The patient has since come to the clinic for check-ups on a half-yearly basis, with the most recent check-up coming earlier this year. While the regrowth is likely to have reached its peak with the current treatment, it has been a major improvement. The patient is very happy with the current condition of her hair and is now considering supplementing the current laser cap treatment with a medical program to enhance the results further.